Warren Buffett doesn't like tech stocks or losing money. But that doesn't mean he's upset with his IBM bet. This article was updated on Oct. 18, 2016, and was originally published on May 23, 2016. Click here for a fresh look (Feb. 21, 2017) look at Buffett's holdings. Warren Buffett has traditionally been averse to investing in tech companies. However, The Oracle of Omaha made an exception by buying a big position in IBM (NYSE:IBM) in 2011. Buffett kept buying IBM over the next several years, and regulatory filings show that he added to the position in the first quarter of 2016. As of June 2016, Berkshire Hathaway (NYSE:BRK-A) (NYSE:BRK-B) owned 81.2 million shares of IBM, for a market value of nearly $12.2 billion. IBM stock, however, has languished since Buffett started investing in the company. Big Blue is down by almost 20% over the past five years, substantially underperforming the S&P 500 index and its gain of nearly 77% in the same period. Most investors would be quite disappointed with this return, but Buffett is nothing like the average investor. On the contrary, chances are that Buffett is quite thrilled with this lackluster performance from IBM. Let's use IBM as an example. As all business observers know, CEOs Lou Gerstner and Sam Palmisano did a superb job in moving IBM from near-bankruptcy 20 years ago to its prominence today. Their operational accomplishments were truly extraordinary. But their financial management was equally brilliant, particularly in recent years as the company's financial flexibility improved. Indeed, I can think of no major company that has had better financial management, a skill that has materially increased the gains enjoyed by IBM shareholders. The company has used debt wisely, made value-adding acquisitions almost exclusively for cash, and aggressively repurchased its own stock. Buffett then explains that long-term investors in IBM would actually benefit if the stock price remains stagnant or even declines over the years. Today, IBM has 1.16 billion shares outstanding, of which we own about 63.9 million, or 5.5%. Naturally, what happens to the company's earnings over the next five years is of enormous importance to us. Beyond that, the company will likely spend $50 billion or so in those years to repurchase shares. Our quiz for the day: What should a long-term shareholder, such as Berkshire, cheer for during that period? The logic is simple: If you are going to be a net buyer of stocks in the future, either directly with your own money or indirectly (through your ownership of a company that is repurchasing shares), you are hurt when stocks rise. You benefit when stocks swoon. Emotions, however, too often complicate the matter. Buffett is clearly on the buying side when it comes to IBM stock, so he has benefited from a declining stock price over the past several years -- both because of his direct purchases and by the fact that IBM has been able to repurchase more stock with the same amount of capital. 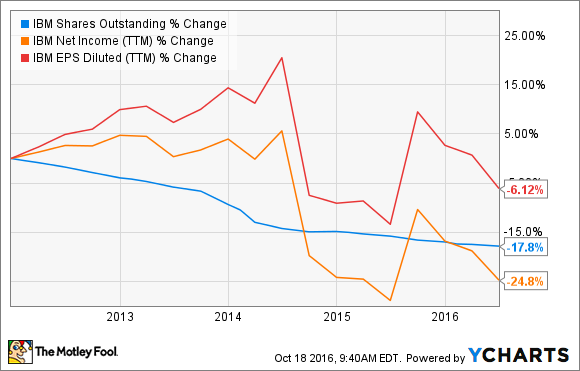 The following chart shows IBM's shares outstanding, net income, and earnings per share. The company has reduced the amount of shares outstanding by a huge 18% in the past five years. However, the fact that net income has substantially declined over that period is a big limitation in terms of earnings-per-share growth. For this reason, the main question for investors is whether IBM can jump-start earnings growth in the coming years. The company is going through a transformation. IBM is moving away from low-margin businesses toward areas with higher room for growth and profitability, and this move is hurting revenue. Segments such as transaction processing software, consulting, integration software, and hardware have been quite weak over the past several years. However, IBM is aggressively investing in a group of business it has identified as "strategic imperatives." This group includes cloud, analytics, security, social, and mobile technologies. Performance from strategic imperatives has been quite promising lately, and management believes it can produce sustained growth from these segments over the years ahead. Sales from strategic imperatives grew 16% in the second quarter of 2016, and the segment accounted for 40% of IBM's total sales over the past 12 months. The cloud-computing business was particularly strong last quarter, with constant currency revenue growing 44%. The jury is still out as to what kind of performance IBM can sustain. However, chances are that strategic imperatives will account for a growing share of the business, and this could be a major positive in terms of sales and earnings growth. IBM has repurchased lots of shares at cheap prices over the past several years, and Buffett has also invested considerable amounts of fresh money in the company over this period. If IBM can jump-start growth, all those shares purchased at conveniently low prices could turn out to be tremendously profitable investments, both for IBM and for Warren Buffett.